When I went to Europe at the end of last year, people asked me where I was from. Of course, they didn’t know where New Jersey was, so I said New York City. “Yes!” They’d reply, “The Big Apple! You’ve been to the Statue of Liberty? And the Empire State Building?” They’d go on and on, listing the major attractions of the city — a city I was only over the bridge from, but had never spent much time in. Sure, I’d been to the Statue of Liberty or the famous museums as a kid, but I don’t really remember. So for my birthday this year, rather than jet off to some other country/state, I decided to take off of work and explore the famous spots in New York City. 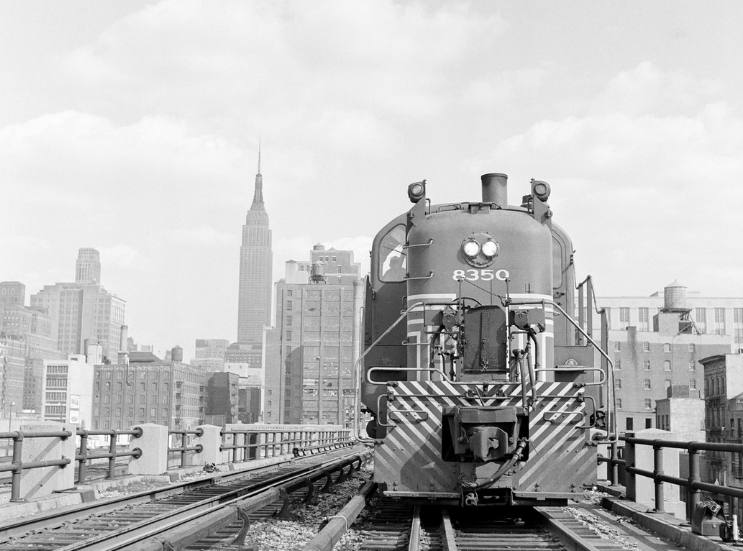 In the 1930s, the High Line was known as the “West Side Elevated Line.” This railroad delivered directly to major factories like the National Biscuit Company, Nabisco. The High Line that we know today, is the converted railroad turned into a public park. It is a total of 1.45 miles of nature and art, stretching from Gansevoort Street to 34th Street (West Side). The High Line wasn’t always a well-known destination in New York. It was between 2004-2009 that the community gained a sense of pride for the restored space. Artwork and an agreement upon the use of the railroad brought about the walking paths that we know today. Owned by the City of New York and maintained by Friends of the High Line, anyone visiting New York can walk the winding path — enjoying architecture, the foliage, artwork, and a place to rest. As mentioned above, the “West Side Elevated Line” delivered goods to the Nabisco factory. Nabisco invented Oreos, Chips Ahoy!, Triscuit crackers, Fig Newtons, Teddy Grahams, and more. Nabisco was the renamed merger of several bakeries in 1898, when baked goods were known regionally. After the merger Nabisco was so large that it produced half of the country’s cookies. In 1958, Nabisco’s production and shipping volume required that it move to the suburbs of New Jersey. While the Nabisco factory wasn’t completely abandoned, the nearby neighborhood declined as a result of the company’s move. In 1990, investor Irwin B. Cohen bought the factory and with financial support, formed Chelsea Market. Chelsea Market now houses 58 shops and restaurants, as well as many office spaces. Food Network and Google (who now owns Chelsea Market) are some of the major companies who use the office spaces. The restored High Line, the formation of Chelsea Market, and the multipurpose use of the space, rekindled the area for both locals and tourists. 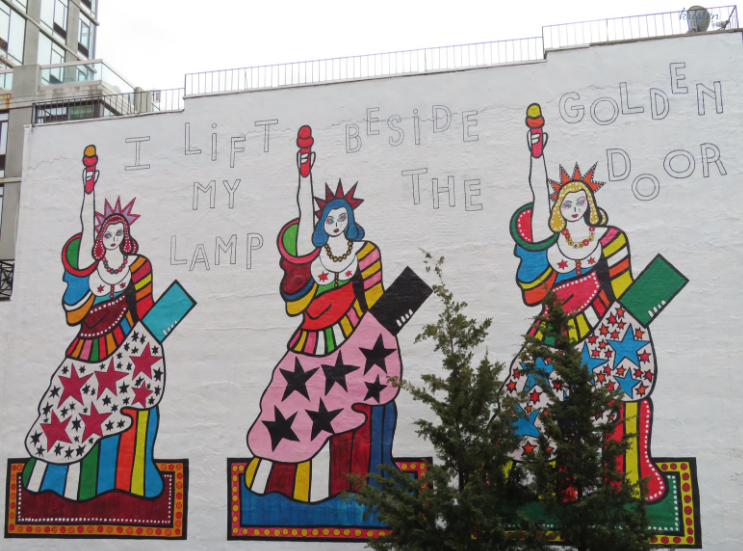 I saw this mural from the top of the High Line. The sign on the building read, “Chelsea Square Market” and thought: Wow, that looks tiny. Is that the Chelsea Market? It turns out that’s clever branding for a separate market in this area. The actual entrance to Chelsea Market is on 10th Ave, making a left from The High Line staircase. When I found the entrance, I walked into the large foyer and up a ramp, past the visual history of Chelsea market. I turned right and through two glass doors, a large open room housed Artists and Fleas. It was like an indoor flea market for handmade goods. Most of the stands were jewelry. One section was for soaps and hand-woven pillows, clothing, and painted glass artwork. I looped through all of the market aisles before heading back out into the main stretch of Chelsea Market Shops. Blackbarn — Minimalist interior decor and a cafe. Buon Italia — Imported Italian goods including mustard, spreads, oils, desserts, truffles, cheeses, meats, and premade food. Chelsea Market Baskets — Variety of goodies for the home, decorations, and desserts. Dickson's Farmstand Meats — A butcher counter where you can watch the meat cut to order. Manhattan Fruit Market — Gorgeous fruit displays organized for OCD shoppers. Posman Books — I spent about 20-minutes in the food section, let alone their card displays. Bowry Kitchens — Chef tools and dishware. Up until this point, I was thriving on my morning coffee. Now it was noon and I needed something to eat, but I still wanted to visit all of the places I had on my foodie-list. So I left Chelsea Market and headed to my first destination — Milk Bar Chelsea. I first heard about Milk Bar and Christina Tosi from Netflix’s show Chef’s Table. In her episode, viewers learned about Tosi’s love of baking, her early career post-culinary school, and how she created the famous treats she now sells at Milk Bar. Tosi is a two-time James Beard Award Winner and named 40 under 40 by Fortune Magazine, MasterChef judge, Cherry Bombe Podcast guest, and all-around pastry innovator. I decided that I wanted to try some of her famous treats. Despite the 40-degree windy weather, I was going to have ice cream. I wasn’t surprised that Milk Bar Chelsea was a white brick building with the classic pink Milk sign in the front window. 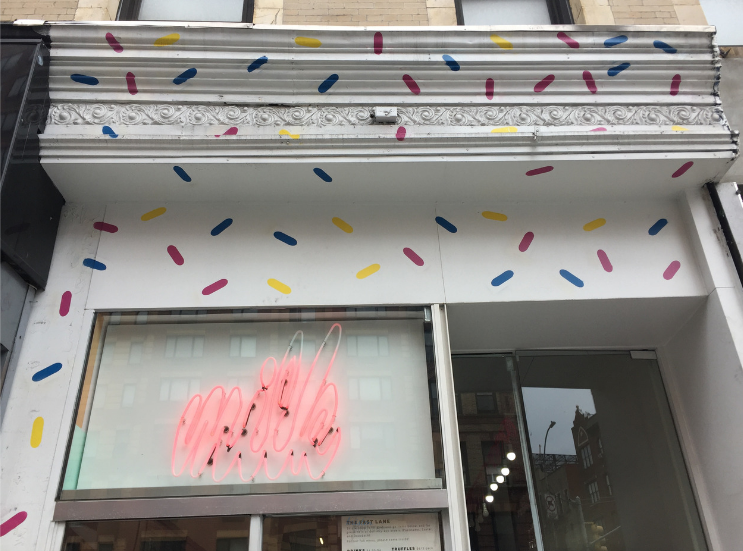 If you watched Chef’s Table, part of Milk Bar’s branding is the creation of the custom pink sign. As I saw from Milk Bar D.C. and L.A., most of the Milk Bar locations are walk-up windows without any seating. I was happy that on the not-quite-winter’s-day, that I could step inside Milk Bar Chelsea to place my order. Milk Bar Chelsea was like a cute closet. Most of the space was the counter / ordering window. A young girl and man worked behind the counter in Milk Bar t-shirts. I read the chalkboard menu when I thought about my options: Am I really going to get ice cream? I thought. “How big is the ice cream?” I was lactose intolerant and I didn’t want to swallow a dairy pill with a bottle of soda. The girl leaned on the counter and pointed to a cup display. “We fill it high above the container.” She must’ve thought I was complaining that there wouldn’t be enough ice cream. In fact, I was thinking that the littlest container would be too much. The crack pie at Milk Bar was one of the first recipes Tosi created while still in culinary school. I was still looking at the ice cream flavors. Milk Bar was known for creating ice cream / flavors by soaking cereal in milk, discarding the soggy cereal, and using the infused milk to create recipes such as ice cream. Welcome to New York, at least they take Visa. The girl placed a cardboard box on the counter. It took me the entire time of standing there to realize that it was my crack pie. Weren’t they supposed to warm it? I thought. I waited for my ice cream. After a minute or two, she handed me the container with the little wooden spoon. “Thank you. Can I sit in here?” Directly behind me was a station with napkins, honey, sugar, etc. Next to that was a low wooden bench against the wall. There was no outdoor seating, and I didn’t want to freeze outside eating ice cream anyway. “Go ahead.” I took some napkins and sat on the end in front of the pink Milk Bar sign. I tried the ice cream on its own first. It wasn’t sickeningly sweet, as you might imagine. Soft serve’s creamy texture is one of my favorites. Despite the cold weather, I enjoyed having the ice cream. However, I couldn’t tell the difference between Tosi’s cereal milk ice cream and normal vanilla ice cream. Maybe that’s because I eat ice cream so infrequently. But I felt like I needed a normal soft serve to compare the two by, to see if there was really a difference in flavor. The corn flakes were the star of the dish. There was a saltiness and richness to them that was perfect for the ice cream. I wonder if the corn flakes are mashed and mixed with butter like some type of crumble, or are plain ol’ corn flakes always this good? The combination of the corn flakes and ice cream together is what makes this an innovative treat. The bottom of the cup was layered with corn flakes as well, so the melted vanilla ice cream created the traditional cereal effect as it pooled around the corn flakes. Overall, I would give the corn flake soft serve a 6 out of 10. The corn flake soft serve was a tasty treat, but I wouldn’t give it anything higher because I couldn’t tell that it was cereal milk ice cream. I didn’t have enough hands to open the crack pie and balance my ice cream. A father with his three kids (who I saw outside when I arrived) said it was too cold to eat out there, so they joined me on the tiny bench. I balanced my bag and phone on my lap, trying not to spill my ice cream. I didn’t have a microwave in my Airbnb, so I ate the crack pie two days later when I got home (because I wanted it warm). I was surprised at how small and thin of a slice this was when I opened the cardboard box. The crack pie was wrapped in parchment paper like a neat little gift. I was shocked that after 2 days of being carted around and crushed in my bag that it was still sliced perfectly. I tried a small piece of it at room temperature — it was insane. It tasted like raw sugar cookie dough had a baby with cooked brown sugar and a tiny bit of oats. It was very sweet. It even had a bit of glazed sugar on the top. I popped it in the microwave for 10 seconds to see if that changed the flavor/texture. It makes the texture even softer, if you can believe it. Heating it must’ve released the butter because there was a bit of greasiness on the palate. The oat crust was a needed texture. The overall taste of the pie was butter, brown sugar, and vanilla. I imagine that this is why the slice is so small and thin. One, because it’s so rich, but two, because there’s nothing to rise when baking — it’s all sugar! No wonder it’s crack pie, I can’t imagine how many calories are in this slice. The thicker crust at the top of the slice reminded me of oatmeal raisin cookies, minus the raisins. The rest of the pie texture reminded me of the pecan pie filling, with a crust on both the bottom and top. Overall, I would give this an 8 out of 10. If you adore sweets, then this will probably be a 10 out of 10. Personally, this was overly sweet for me (and I love desserts). I found greasy coating while eating it to be unappealing. This could be the result of warming it (so take this note with a grain of salt). Maybe if I ate the slice cold, I wouldn’t have experienced that. Either way, I can see why this dessert is addicting and a Tosi classic. I had a list of restaurants I wanted to visit. Milk Bar Chelsea was already halfway to my second destination. With the grey clouds overhead, I carried the rest of my melting corn flake ice cream into the wind and headed to the next stop. Stay tuned for the next restaurant review, coming soon!